Eli Damon preparing for a hazardous rail road crossing during CyclingSavvy Instructor training. Eli is an experienced transportation cyclist and traffic cycling instructor, and well-versed in the numerous safety benefits of visible lane positioning. He also has a thorough understanding of how to facilitate safe overtaking when appropriate (a CyclingSavvy technique called “Control & Release”). With all of this in mind, I was completely stunned while reading a recent editorial titled “A wise ruling on bicyclist’s use of Route 9 in Hadley” in The Daily Hampshire Gazette. The un-attributed author of the piece shows a complete ignorance of cycling safety, actual laws, and even journalistic ethics. The unwarranted police interference with Eli’s right to travel safely on our public roads made his only means of independent travel nearly impossible. Eli had been repeatedly harassed by police officers (The Hadley Encounters, The West Springfield Encounters, The Third Hadley Encounter: Relapse), so he should not be chastised for using common video equipment to record the encounters. The justice system holds a sworn law officer’s word in higher regard than that of a citizen. Unfortunately, this favors dishonest officers. Many of us have seen videos that contradict statements made by such officers. It’s a sad reality that citizens (especially ones in a minority) need to protect themselves from some of those sworn to serve and protect us. When I originally bought my Oregon Scientific ATC5K sport video camera, it was because I wanted capture footage of my bike rides for educational videos. I had seen videos from John Allen, Dan Gutierrez and Brian DeSousa, and Keri Caffrey and Mighk Wilson, and I wanted to do something like they had done. I wanted to show my community our local roads from a new perspective. I wanted to show them that there was no reason to be afraid of motor traffic on those roads, and wanted to show them the benefits of an assertive position, and the absence of the danger that many imagined. Eli wants to prove a point? At great expense to himself, he is not seeking monetary damages for the harassment, humiliation, unwarranted confiscation of his property or curtailment of his ability to travel—a violation of his civil rights. He is simply seeking the ability for himself and other bicyclists to travel safely on public roadways without continued threat of police interference and harassment. That’s quite a point. For something more official, read Bicycle Law Enforcement: Enforce Laws with Mutual Respect in Law & Order Magazine. The ruling actually DOES validate lane control. There is not enough space for a car to pass this bicyclist without using a significant portion of the adjacent lane (such that that lane would need to be free of traffic). By riding in this position, the bicyclist is creating the illusion of courtesy while exposing himself to risk of being sideswiped by a motorist who mistakenly tries to squeeze past. The implication of that statement is that bicyclists are not required to ride right by default: they must only move right under certain conditions. While it is, in a sense, a victory to have a federal judge acknowledge the validity of lane control, the editor’s misinterpretation of the ruling demonstrates the same prejudicial misunderstanding that has led to this case in the first place. Therein lies the problem. 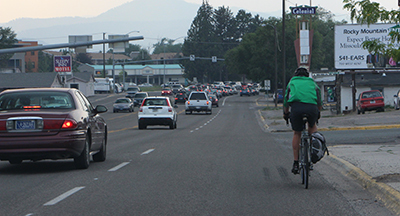 In many conditions it is unsafe, or impossible, for a bicyclist to move far enough right so that a motorist does not have to use a significant portion of the adjacent lane to pass. At that point, there is little difference to the motorist versus just changing lanes. Does the bicyclist still need to move right for show? Does the bicyclist have the autonomy to make that decision? Must he repeatedly defend that decision to the police and courts of law? Who decides when and what is safe? Our roadways are a cooperative system. In our daily interactions, most road users cooperate with each other in a civil manner — facilitating each other to enter or leave the roadway, make lane changes and pass more easily if we are considerably slower. We also cooperate by discouraging or mitigating each other’s mistakes to prevent crashes. Actual crashes are a mere fraction of the potential crashes that never happen because one party compensated for the mistake of another. But what is cooperation? It seems to mean different things to different stakeholders. The law is vague on this matter — as it should be — because cooperation cannot be legislated or mandated, especially when it concerns decisions which affect safety. The bicycle, because it is both narrow and slow, creates a complex problem for the concept of cooperation. The bicyclist’s vehicle provides no shell or buffered space around him. Therefore, the bicyclist must rely upon, or proactively encourage, the drivers of other vehicles to allow a buffer of space when passing. 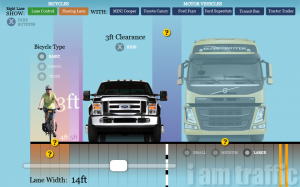 Lane control is an effective tool for proactively discouraging the common mistake of passing dangerously close. In addition, the narrowness presents the problem of being invisible or irrelevant — often overlooked by drivers making conflicting movements; this is a problem that is common to, and well understood by, motorcycle drivers. Lane control makes bicyclists more visible and provides them with vantage to see potential conflicts and compensate for the mistakes of others. But that same narrowness, coupled with slow speed, leads to the prevailing assumption that bicyclists should, by default, squeeze to the edge to facilitate faster traffic — even when that eliminates their ability to compensate for— and prevent—the mistakes of other drivers. Unlike many states, Massachusetts does not have a bicyclist-specific roadway-position law. However, its slow vehicle law uses vague wording for “safe operation” that leaves room for interpretation. Judge Neiman’s ruling did not clarify what is safe and who is to determine what is safe. Unfortunately, it still implies that a bicyclist can be subjected to a level of scrutiny not applied to the driver of any other vehicle. No one would think to compel the operator of a car, or even a narrow vehicle like a motorcycle, to operate continuously at the right edge of a lane, or to move frequently back and forth to allow faster vehicles to share all or part of the lane for more convenient passing — or, in most cases, the illusion of more convenient passing. Yet, it is “common sense,” according to the Gazette Editor, to compel a bicyclist — who operates the least robust vehicle and is passed with the highest speed differentials — to do just that. This sentiment is nothing less than car-centric bigotry. It is the removal of autonomy and assignment of second-class citizenship to the drivers of a particular class of vehicle. In reality, the language of MGL 89-2 is very old. It is a vestige of the early days of narrow, unlaned and often unpaved roads. These roads were typically crowned with steep or soft edges, making it prudent to drive in the middle of the road (not lane). 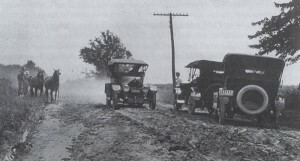 As common practice was to drive in the middle, all slower drivers were required to move over to accommodate passing. The current slow vehicle law in most states (based on an updated Uniform Vehicle Code which MA did not adopt) requires the drivers of slow vehicles to operate in the rightmost thru lane (except when passing, avoiding a hazard or preparing for a left turn). This reflects current roadway design, and (absent bicycle-specific discriminatory laws) applies equally to bicycles as to other slow vehicles. Since the parts of Route 9 where Eli was stopped have multiple lanes, there is no rational reason to expect the driver of any slow vehicle to accommodate unsafe same-lane or lane-split passing, nor to operate on an intermittently-unusable, debris-filled and conflict-ridden shoulder. The most disappointing and frustrating part of all of this is that Eli has been almost completely alone in this battle. Despite repeated pleas for assistance and advice to MassBike and the League of American Bicyclists, Eli has been turned down and ignored. The very least that these organizations could have done is publicize his case and situation. 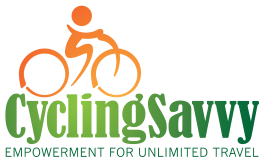 If these organizations cannot rally around someone who must use his or her bicycle on a daily basis for their sustenance, what is their basis for existence? Currently, I Am Traffic is a loose coalition of volunteers and educators. We hope one day to be an organization with the resources to support bicyclists like Eli in the effort to allow all bicyclists safe, unhindered travel on our public roads. This post was co-authored by Keri Caffrey. “If [Neiman’s ruling] had supported Damon’s claim riders can use the middle of a travel lane, people would get hurt. Even if lawful, it wouldn’t be safe.” So, did the judge say it was lawful or not lawful? I’m still confused. Maybe he ruled on the move-over part while leaving the middle-of-the-lane part unanswered. Did Eli win his case or lose it? That’s a fundamental question. 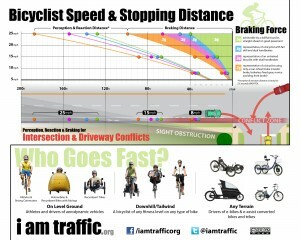 has much information that applies equally to bicycle users. Here’s a money quote which has a corresponding graphic showing a car changing lanes, as should happen when passing bicycle drivers. Who won the case? How does the outcome of the case affect my ability to control lanes when cycling in Massachusetts? For its part, the court, in light of the plain language of the statutory provisions, has little trouble concluding that Massachusetts law requires a slower-traveling bicyclist to pull to the right to allow a faster-traveling motorist to pass when it is safe to do so under the circumstances. The statutes also create reciprocal obligations on the part of both motorists and bicyclists to ensure that passing would occur only at a time when it is safe to do so and only in a safe manner. Such safety, of course, would include the configuration of the roadway and its shoulders, as well as their conditions and/or states of repair. If need be, these safety considerations must be measured from an objective rather than a subjective viewpoint, because one person’s idea of “safety” may differ greatly from another’s. The judge understood in some ways that bicyclists are drivers of vehicles under the law, but failed to understand that the shoulder is not part of the roadway, and that when pulling to the right to facilitate passing, there is no obligation to leave the roadway. In fact, Mass. statutes require drivers to be completely within a “lane,” and a shoulder is not a lane. I think the Complaint failed to make these points well, and the outcome might well have been more favorable had it been better argued. This means that the cyclist is responsible for (gets to decide) when and how an overtake is to occur. If a motorist is attempting an unsafe overtake (for example, in the face of oncoming traffic in a blind curve on a narrow, two-lane road with no shoulder) the cyclist is responsible for moving into a position that would encourage the motorist to reconsider. Also known as Controlling the Lane. Massachusetts law: “…the driver of an overtaken vehicle shall give way to the right in favor of the overtaking vehicle on visible signal…” nonsensical. The following vehicle may be completely hidden behind the leading one, whose driver also must be looking forward almost all of the time. What signal is supposed to indicate the desire to overtake? I’ll be writing more about this in another article. Perhaps a holdover from the eighteenth century? I think the signal is left arm out the window executing a forward tomahawk chop. With due respect to the foibles of MA law, perhaps a step forward would be to draft Model Vehicle Code language that transportational cyclists can agree with. Personally, I like the part of the ruling that talks about mutual obligations in a passing scenario. Bicyclists are not unique in that farm equipment, horse-drawn carriages, horseback riders and other slower vehicles have the same issues when being overtaken by faster vehicles. I like NJ’s solution as applied to horseback riders – motorists must slow down and follow the rider’s hand signals.